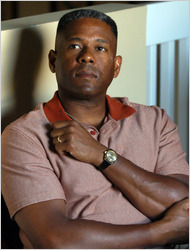 Allen West, running in Florida, says the notion of racism in the Tea Party movement has been made up by the news media. If some of these candidates wind up winning, who would like to wager that they won't be welcomed into the Congressional Black Caucus? In Commentary, Jennifer Rubin stated: "If a batch of these candidates wins ... the Congressional Black Caucus will be properly recast as the Liberal Congressional Black Caucus." Marvin Scott won his May 4th primary in the Indiana 7th district, which covers most of Indianapolis. In November, he will face incumbent Democrat Andre Carson, son of late congresswoman Julia Carson, and one of only two Muslims in the US Congress. In North Carolina's 1st District, Jerry Grimes lost his 5/4 primary to white Goper Ashley Woolard, who will face incumbent Democrat G.K. Butterfield in November. In North Carolina's 8th District, Lou Huddleston won 8% of the Goper primary vote. Two white candidates, businessman Tim D'Annunzio and sportscaster Harold Johnson are in a runoff for the privilege of facing incumbent Democrat Larry Kissell, a liberal and frequent Daily Kos poster. In North Carolina's 13th District, Aftican American Goper Bill Randall, was, by a razor thin margin, the largest vote getter in the Goper primary. He faces white Goper Bernie Reeves in a June 22nd runoff. One of them will run against incumbent Democrat Brad Miller in November. William Hurd, a black Goper, former CIA officer, and endorser of the Club for Growth health care repeal pledge, lost his April 13th runoff against Bill Flores, who will face incumbent Democrat Chet Edwards in the Texas 23rd District race in November. Oh, yes, I almost forgot. One Isaac Hayes is the Goper candidate for Illinois's 2nd District seat. He will be running against incumbent Democrat Jesse Jackson, Jr. Don't hold your breath on this one. RebLem wrote: Oh, yes, I almost forgot. One Isaac Hayes is the Goper candidate for Illinois's 2nd District seat. He will be running against incumbent Democrat Jesse Jackson, Jr. Don't hold your breath on this one. Do you mean to say that Isaac Hayes is going to get the shaft?